With the dates for the Northern Beaches Festival fishing competition fast approaching I have asked the president of the association to write a few words. This what he had to say on the event. Last year, my first year as president of the Northern Beaches Festival I was introduced into the dynamics of this diversified Festival. It is truly a wonderful slice of the lifestyle that we all share. Part of that recreational time or for some most of it, is fishing. The Festival features 3 Fishing competitions that differ greatly from each other but are designed to serve the majority of anglers. 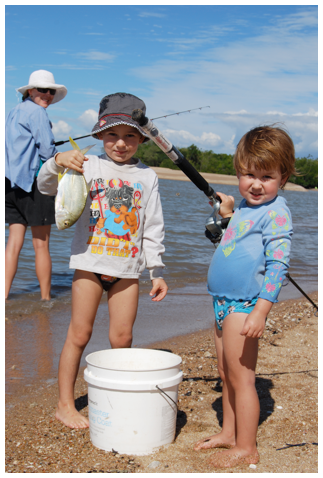 The Pro Tackle Junior Beach Fishing Competition is my personal favourite. To see the faces on the littlies holding up their catch is a delight. I rummaged through my shots from last years competition and came up with this. Regrettfully I did not record the name of the family so if they read this post Mal and I will send copies to you. The brother his holding up his sisters catch, mum looks on. The lass won a great prize a tackle box full of Shimano goodies. Don Cummings from the Toomulla Beach Fishing and Social Club has been running this contest in conjunction with Pro Tackle Townsville and Shimano for a number of years. The prizes are superb and the event promotes the sport at an early age with categories for Pre-School, Primary School and High School. The Pro Tackle Junior Beach Fishing competition has traditionally been conducted as a stand alone event at Toomulla Beach but this year Don and his committee have agreed to trial it in conjunction with the Balgal Big weekend at Balgal Beach on Sunday 23rd May 2010. Cost per entry is $5. The event will be conducted alongside the NQ Cool Wheels (200 vehicles on display). Markets, Music on the land and Mayhem on the water with outrigger races, Kiteboard demonstrations and TS Coral Sea Naval Cadets. Registrations forms are available to be downloaded form this site or at the cenotaph Balgal beach from 9am on Sunday 23rd. I guarantee no one will be board – the day will be one big buzz. Tackle World Open Fishing Competition is for the serious anglers. It starts on the evening of Friday the 21st May and runs through to 3pm on Sunday 23rd followed by the Presentations. This is conducted by the Fishermans Landing Fishing and social club from the Landing at Balgal. Tackle World have released a comprehensive list of the prizes which when you do the maths is very significant. Every junior that enters also receives a prize. Again the registration forms are available online from this site as well as the list of prizes. The boys at the landing asked me to advise that there are some variations to the final prizes categories compared to the first ones drafted last November 2009. For the fishing widows on Sunday come and enjoy the party that will be on the Esplande and on the Beach. A special children’s corner, 200 cars on display, markets, music, good food and drink. The Balgal Big weekend is about our Northern Beach lifestyle. The Member for Hinchinbrook Challenge is an inter club competition for all registered clubs between Cardwell and Townsville (Alligator Creek). This event is a month long event commencing 1st May to 28th May 2010. The winning club has the privilege of hosting the following year. I know a number of clubs have expressed interest early and I know there is still time for those that have not advised the Landing they can do so on 4770 7227 and register the club. It’s a simple matter of recording your combined members catch over the period. At the end there is a great social and a great way to share fellowship and the love of the sport. For all those that enter the competitions good fishing but most of all enjoy the occasion.